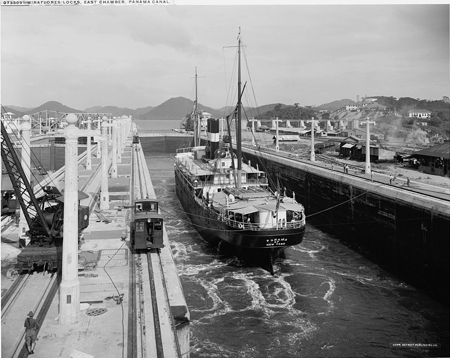 Today in History–September 7–the Library of Congress features the Panama Canal. On this date in 1977 U.S. President Jimmy Carter and Panamanian Chief of Government Omar Torrijos signed the Panama Canal Treaty and Neutrality Treaty, which officially authorized the transfer of the canal’s authority from the United States to the Panama Canal Authority on December 31, 1999. Find out more by visiting the Today in History section and reviewing the Panama Canal timeline below. Then click the links below to access more primary sources about how the canal was built and resources related to Panama. 1889: The French abandon an unsuccessful attempt to build a canal through Panama connecting the Pacific and the Atlantic Oceans. June 19, 1902: The U.S. Senate passes the Spooner bill, authorizing the government to build a canal through Panama. January 1903: The Columbian senate fails to ratify The Hay-Herrán Treaty, which would have provided the U.S. with the land and rights to build a canal through Panama. November 1903: A revolution in Panama, aided by the U.S., results in Panamanian independence from Columbia and the establishment of the Republic of Panama. February 23, 1904: Panama grants the U.S. control over the Panama Canal zone for $10 million. May 4, 1904: The U.S. acquires French property relating to the canal for $40 million. Construction begins the same year. November 1906: President Theodore Roosevelt travels to Panama, becoming the first U.S. president to travel abroad while in office. August 15, 1914: The Panama Canal is officially opened. “The Panama Catastrophe,” The Pittsburgh Dispatch (Pittsburgh, PA), January 3, 1889, Page 4, Image 4, col. 6. “The Much Discussed Panama Canal Route,” The Washington Times (Washington, DC), March 16, 1902, Page 3, Image 19, col. 1. “Panama Friends are Victorious; Spooner Substitute Passes,” The St. Louis Republic (St. Louis, MO), June 20, 1902, Page 5, Image 5, col. 2. “Washington Government does not conceal its Belief that Revolution will be Successful,” The San Francisco Call (San Francisco, CA), November 5, 1903, Page 1, Image 1, col. 4. “Canal Treaty is Ratified,” The Hartford Republican (Hartford, KY), February 26, 1904, Page 1, Image 1, col. 3. “Canal is ours Fast and Tight,” The Washington Times (Washington, DC), May 4, 1904, Page 1, Image 1, col. 1. “Uncle Sam Formally takes charge of Panama Canal,” The Tacoma Times (Tacoma, WA), May 4, 1904, Page 1, Image 1, col. 4. “Photographs in the Panama Canal Zone made shortly after,” The New York Tribune (New York, NY), February 11, 1906, Page 2, Image 2, col. 1. “President Sails for Isthmus,” The Los Angeles Herald (Los Angeles, CA), November 9, 1906. Page 1, Image 1, col. 1. “President Roosevelt Gathering Information at First Hand about the Panama Canal,” The New York Tribune (New York, NY), December 16, 1906, Page 1, Image 17, col. 1. “Panama made Clear,” The New York Tribune (New York, NY), November 12, 1906, Page 1, Image 1, col. 1. “The Panama Canal a Sound Business Proposition,” The San Francisco Call (San Francisco, CA), April 19, 1908, Page 7, Image 7, col. 1. “Panama Canal now open to Commerce of the World,” The Evening Herald (Klamath Falls, OR), August 15, 1914, Page 2, Image 2, col. 3. “Ancon Officially opens Panama Canal Today,” The New York Tribune (New York, NY), August 15, 1914, Page 14, Image 14, col. 4.